This five bedroom family home is well situated just off the village cricket green enjoying southerly aspects over its own grounds of approximately three acres. The land comprises formal gardens, paddocks, sand school and stable yard, appealing to those with equestrian pursuits. The property comprises of a character home offering spacious and adaptable accommodation enjoying bright and sunny aspects over the grounds. The double aspect sitting room with open Jet Master fire is a delightful room and has an adjoining study and dining room. 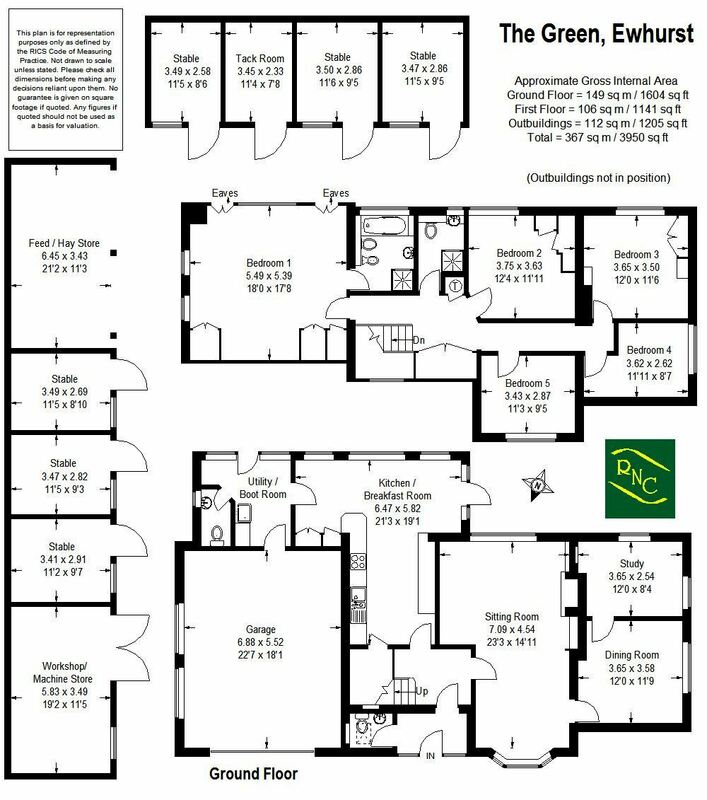 In addition, there is a good size kitchen/breakfast room with similar open aspects and adjoining utility room and access to the integral double garage, that could be incorporated into the accommodation, subject to the usual planning consents. On the first floor there are five good size bedrooms, with a large double aspect master bedroom suite with lovely views. Outside the property benefits from the afore mentioned gardens and paddocks and we highly recommend an early visit as properties of this nature are rarely available in this location. From our office turn left into the High Street and proceed to the second mini roundabout. Take the Ewhurst Road and continue for approximately two and a half miles. Turn right into Gadbridge Lane, just before entering the village and at the T junction turn right. After a short distance turn right into the driveway, signposted Old House and Wagtails and the property will be found on the left hand side. Ewhurst is a lovely, semi-rural village nestled at the base of the beautiful Surrey Hills just a few miles north east of Cranleigh. Its population of 2,500 have access to an array of amenities including a general store, Bulls Head public house, medieval church and a variety of independent retailers including a hairdresser, beauty shop and vet practice. The village has a play group, pre-school and infant school as well as a range of private and state schools in nearby villages. These include Duke of Kent School in Peaslake, Hurtwood House School, Cranleigh School and Glebelands High. It has a range of sports and social clubs with local playing fields, a polo club and a wonderful area for pursuing outdoor activities. Mainline stations are available in Guildford or Dorking. Comprising; close coupled WC, wash hand basin, quarry tiled flooring, sky light window. A delightful double aspect room with views over the gardens and grounds. Jet Master style open fireplace with adjoining alcove display shelves. Four wall light points, side aspect over garden. Double aspect overlooking the garden, three wall light points. Door to back garden, gas fired boiler for hot water and heating, Belfast sink with cupboard under, space and plumbing for washing machine. Personal door to garage. Comprising, close coupled WC, wash hand basin, quarry tiled flooring. Access to roof space with pull-down ladder, eaves storage cupboard, linen cupboard with hot water cylinder. A delightful double aspect room with views over the grounds, built-in wardrobe cupboards, eaves cupboards. With panelled bath with mixer tap and shower attachment, pedestal wash hand basin, concealed cistern WC, bidet, tiled shower enclosure with thermostatic shower, part tiled walls. Range of fitted bedroom furniture including wardrobe cupboards and dressing table, rear aspect over garden. Range of fitted wardrobe cupboards and drawers, rear aspect over garden. Comprising; concealed cistern WC, tiled shower enclosure with thermostatic shower, vanity unit with wash hand basin, part tiled walls. The property is approached via a tarmacadam driveway providing plenty of off road parking leading to the double garage. Wide side access to garden and grounds. The formal gardens comprise level areas of neatly maintained lawns with well stocked flower and shrub borders retained by established hedging and interspersed by a number of specimen of trees and shrubs. The grounds then extend into areas of paddock retained by post and rail fencing with stock proof wiring. Up and over door, power and light points. Comprising; concrete hard standing, 6 loose boxes, tack room, store rooms and hay barn. Adjoining the stable yard there is a all weather sand school retained by post and rail fencing and a five bar gate leads into the paddock. There is power and light and water laid on. Mains gas, electricity and water.